“I got traded for him and now he’s my insurance broker,” said Bill Buckner in 2011.1 Buckner was recalling a January 1977 trade when the Los Angeles Dodgers sent both him and Ivan de Jesus to the Chicago Cubs for Mike Garman, Rick Monday, and a minor-leaguer. Buckner settled in Boise after his baseball career; Mike Garman was born in Idaho. Caldwell, Idaho, is situated on the Boise River along a natural passageway from the Rocky Mountains to the Pacific Northwest and has been dubbed “The Treasure of The Valley.” It was founded in 1883, as the Oregon Short Line Railway was routed through the area. The city soon offered waterways and irrigation canals as well, forming the basis for an agricultural center. The Red Sox assigned Mike to Single-A ball in 1967 and he pitched for two of their farm teams — the Winston-Salem Red Sox (Carolina League) and then the briefest of stints with the Greenville (South Carolina) Red Sox — for just one inning — in the Western Carolinas League. In that one inning, he walked two and gave up three hits, charged with two earned runs. “It was raining, and slippery, and I was off-balance,” he said several years later. “I hurt my arm on a pitch. They operated to remove bone chips from my elbow.”19 For Winston-Salem he appeared in six games, for a total of 24 innings and a 6.75 ERA; his record was 1-3. In 1968 he put in a full season with Greenville. He worked in 20 games, starting 16 of them. Though his record was 5-7, he had a decent 3.73 ERA. In 1969 he put in a full season at Winston-Salem, under the same manager he had had in 1969 - Matt Sczesny. Garman started 24 of 29 games, worked 162 innings (striking out a league-leading 183 batters) and recorded an ERA of 3.11. His record was 10-12 — but, he told the Boston Herald at the time, “In those 12 games, our club was shut out seven times.”20 He also led the league in wild pitches.21After the league season was over, he was called up to the Boston Red Sox. Garman’s debut was on September 22, 1969, at Boston’s Fenway Park, where the Red Sox were hosting the New York Yankees. Neither team was in the running for anything of note. The Red Sox were in third place, 24 ½ games behind the first-place Baltimore Orioles. The Yankees were in fifth place, 30 ½ games back. It was still an intimidating experience for a young pitcher who had been a teenager just six days earlier. Garman’s entire 1970 season was spent in the minors with Louisville, and he struggled a bit, walking more batters (132) than he struck out (127). At one point in mid-June, Red Sox director of player procurement and scouting Neil Mahoney said, “Garman at 20 is the most promising pitcher we have at Louisville. But Garman has also been our biggest disappointment to date.”26 He started 27 games and relieved in one other, with a record of 7-13 and a 4.39 earned run average. Sox manager Eddie Kasko gave Garman three starts in September. Starting the game on his 22nd birthday, he was hit for five runs and didn’t complete the fourth inning, but had no decision in the game. The next two games were quite good ones — giving up only two runs over eight innings for a 3-2 win against Mickey Lolich and the Tigers at Fenway and one run over seven innings against the Orioles in a 1-0 loss. The September callup pattern held in 1972, but in Louisville Garman furthered the transition to relief pitcher, starting 19 games but relieving in 20. He was developing better control, too, pitching 20 more innings, but with 19 fewer walks. He was 11-9, 4.23. In three Red Sox appearances, the one he started was his worst — against the Detroit Tigers. He only faced five batters before being pulled; four of them reached base and three scored. There was considerable criticism of Eddie Kasko for starting Garman with just 13 games to go in the season, against the Tigers who in the end edged the Red Sox by a half-game to win the American League East. That doesn’t mean he was that happy at the time. Perhaps the National League was more to his liking. Perhaps he simply — all of a sudden — lived up to his perceived potential. The Cardinals definitely gave him work. He had an excellent year for St. Louis in 1974. He was one of a tandem with left-hander Al Hrabosky, who appeared in 65 games and finished 31. Garman appeared in 64 games and closed 30. Garman led the team in ERA at 2.64. His record was 7-2. The two — Hrabosky and Garman — wound up almost even in appearances and finishing games in 1975, and both improved in ERA (Garman brought his down to 2.39), but the 13-3 Hrabosky had much more success with wins and losses; Garman was 3-8. He was credited with 10 saves; Hrabosky had 22. Without question, Garman was pitching in “The Mad Hungarian’s” shadow. On October 28, the Cardinals traded Garman to the Chicago Cubs for middle-infielder Don Kessinger and a player to be named later, a minor leaguer. Though fewer men reached base on him per inning in 1976, his ERA leapt to 4.95. His record for the Cubs was 2-4. He started only two games, both times when he was pressed into duty in the second game of doubleheaders. He lost both those starts. He worked in relief in 45 other games. Remarkably, the trade to the Dodgers reunited him with teammate Reggie Smith. The two had been on the Red Sox for the years 1971-73, and on the Cardinals in 1974 and 1975. They played together on the Dodgers in 1977 and 1978. For the Dodgers, he appeared in 49 games, finishing 30 of them. He built up wins to be 4-0 through June, with a 2.51 ERA. By season’s end, his ERA was still quite good, at 2.73, but he’d lost each of his final four decisions to finish 4-4. In 1977, Garman pitched in postseason baseball, earning a save in Game Three of the National League Championship Series against the Phillies. He hit one batter, but didn’t allow a base hit. He appeared in two World Series games, pitching the ninth through the 11th inning in Game One against the Yankees, striking out three and only allowing one hit. He was replaced by a pinch-hitter, and the Yankees won in in the 12th. In Game Four, he pitched the top of the ninth and gave up a single, but no runs. The Yankees held a 4-2 lead, and the Dodgers failed to score in the bottom of the ninth. 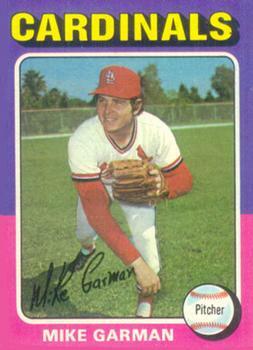 Garman started the 1978 season with the Dodgers and was 0-1 after 10 appearances. On May 20 he was traded to the Montreal Expos for two pitchers, lefty Gerry Hannahs and righty Larry Landreth. For the Expos, he appeared in 47 games, closing 29. His ERA was remarkably consistent for the two clubs, 4.41 for L.A. and 4.40 for Montreal. On March 30, 1979, near the end of spring training, he was released by the Expos. He was listed on the roster of two Pacific Coast League teams that year, Portland and Tacoma. He pitched for Portland through June, and was then dealt to Tacoma for Rob Ellis. The September 8 issue of The Sporting News gave his unofficial combined record as 5-3, with a 4.82 ERA. That was the last year he was in organized baseball. “What happened is that I had a rotator cuff problem. That’s why the Dodgers traded me to Montreal. I was known as a hard thrower. I didn’t trick anybody. I threw the ball by people. When my arm…I got tired of pitching and having tears squirt out of my eyes, because of the pain. They didn’t have the surgery they have now where they can repair a rotator cuff and tighten it up and you can come back and throw harder than you did before. They didn’t have that surgery, so my career was pretty much over. I tried to see if I could heal my arm and come back from it, but you can’t with a tear. His brother Steve kept farming, but Mike took a position as an agent with an insurance firm in Caldwell. “Farm Bureau is an insurance company here in Idaho and we write a lot of insurance for big farms and ranches. I knew everyone in the area. I went to work for Farm Bureau. I’m retiring here at the end of March after 25 ½ years of being with them. In addition to the sources noted in this biography, the author also accessed Garman’s player file and player questionnaire from the National Baseball Hall of Fame, the Encyclopedia of Minor League Baseball, Retrosheet.org, and Baseball-Reference.com. 3 Ibid. Both parents are still living, both 92 years old at the time of the interview. 4 Garman said, “My dad pitched for the University of Wisconsin and World War II broke out. He enlisted, went to radio school, and became a radioman in the Navy. He was on a ship for a couple of years. When he got out, he started pitching again and the Pittsburgh Pirates signed him.” February 2018 interview. 7 Joe Cashman, “Idaho Pitching Whiz Red Sox Top Draft Pick,” Boston Record American, June 7, 1967: 18. 8 Don Whitely, “Sox Vie With Colleges for Top Draft Choices,” Boston Globe, June 7, 1967: 40. 9 Selected #1 overall was Ron Blomberg (New York Yankees) and #2 was Terry Hughes (Chicago Cubs). Garman was third. 10 Clif Keane, “Lyle, Garman Holdouts; Moret’s Shoulder ‘Stiff’,” Boston Globe, February 19, 1972: 21. 13 Associated Press, “Blomberg, Hughes No. 1 Draft Choices,’ Augusta Chronicle, June 7, 1967: 9. 16 More often than not, his weight was listed annually as closer to 215. Garman struggled some with weight issues throughout his career. He picked up the nickname “Pickles” in St. Louis (from Bob Gibson) because of his propensity to eat as many as a quart at a sitting. See Ross Newhan, “Dodgers Weigh the value of Garman,” Los Angeles Times, August 5, 1977: E1. 19 David Condon, “‘Real’ Easy Street Still Eludes New Cub Hurler,” Chicago Tribune, October 30, 1975: C1. Garman literally lived on Easy Street in Caldwell. 20 Bill Liston, “Garman, Sox Win, 4-3,” Boston Herald, September 23, 1969: 45. 21 In both strikeouts and wild pitches, Garman tied for the league lead. 23 Fred Ciampa, “Red Sox Unveil Garman in ‘Year of the Rookie,” Boston Record American, September 23, 1969: 4. 24 Ibid. The game was one of the first games of Yankees catcher Thurman Munson; Garman struck him out twice. 26 Neil Singelais, “Garman Poses Paradox to Sox,” Boston Globe, June 28, 1969: 89. 27 Richard Dozer, “New Cub Garman Likes Role As Relief Hurler,” Chicago Tribune, January 9, 1976: C3. 30 Garman said, “The Red Sox didn’t think that John Curtis and Lynn McGlothen or myself would go on to have good major-league careers. We went on to have decent careers. I think if they would have held onto us, the outcome of that 1975 World Series could have been different.” February 2018 interview. 32 As a major-league batter, Garman actually had more hits in the American League than in the NL. For the Red Sox, he was 4-for-11 (.364), all singles, with one run batted in — an early run in a 1969 game the Red Sox ultimately won, 6-5. In the National League, he was 1-for-31 (.032), with 13 strikeouts. 34 Richard Dozer, “Pay Impasse Sends Rick to Dodgers,” Chicago Tribune, January 12, 1977: C1. 35 “Charmin’ Garman,” Chicago Tribune, January 21, 1977: C1.